Significant heat transfer during the cooling of materials, be it solid or liquid, which results in temperature increase. Recalescence occurs among others as a result of the solidification of liquid materials (e.g. eutecticsolidification of cast iron) as well as phase transformations. Crystallization heat is emitted once solidification starts. This is the same heat which has been supplied as melting heat (latent heat). 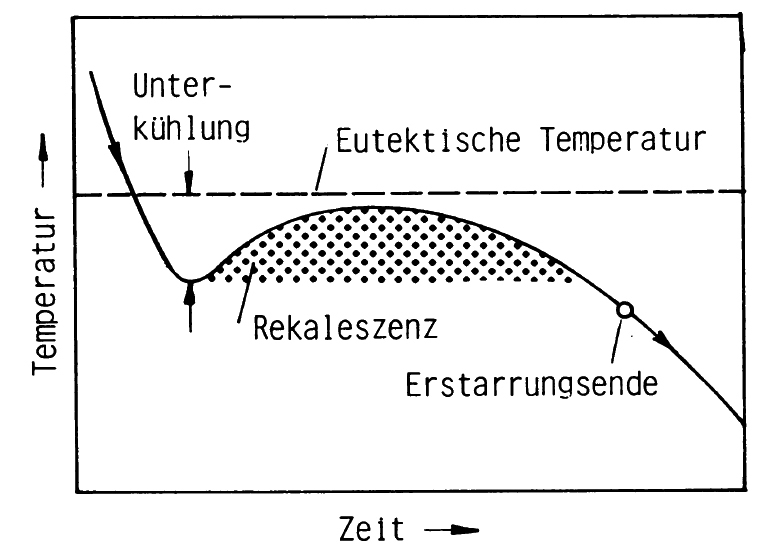 The molten metal is reheated by this emitted crystallization heat which is illustrated as recalescence (temperature increase) on the cooling graph. Once the solidifaction process is completed, the temperature continuously drops. In other words: recalescence is the temperature increase between the lower and upper eutectic temperature, i.e. the maximum temperature during eutecticsolidification. (Fig. 1). If the hypoeutectic temperature is low and recalescence is high, the molten metal is poorly inoculated. Premature graphite formation occurs if the hypoeutectic temperature is adequately high and recalescence is also high. This is not only a waste of graphite in the molten metal but increased pressure is applied to the mold wall which increases cavity formation during solidification. Thus, high recalescence is always a sign of iron with a high micro cavity tendency.